The on-stage appearance of Google’s CEO Eric Schmidt and Sam Palmisano at the IBM Partnerworld conference in Los Angeles may pronounce the single largest development to hit the cloud computing space. IBM, with its established credibility in the server and enterprise applications space makes the perfect partner to Google for taking cloud computing to the commercial masses – i.e. the businesses. What Schmidt and Palmisano revealed on stage, however, is that both companies are interested in using cloud computing to make money. No surprise there, but the two leaders are ready to capitalize on each other’s strengths to help get the job done. For example, Google sees a future where IBM’s reputation with businesses can help drive sales of Google Apps, and IBM, of course, can provide the hardware, additional software, and infrastructure services to tie it all together for enterprises around the globe. 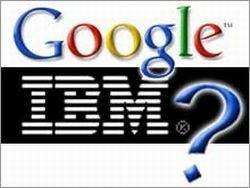 Google is looking at IBM to help it make a major dent in the enterprise space for its desktop applications. Its partnership with the Big Blue is not a recent event though. It partnered with IBM for donating parallel processing based systems to universities as well as in incorporating elements of Web 2.0 in IBM’s commercial software. The roll out of hardware and software to universities such as MIT, Stanford University and UC Berkeley must be seen as the testbed to bring the advantages of massively parallel systems and their corresponding parallel programming paradigms to the academia. The deal is reminiscent of the times when Microsoft and IBM forged a partnership that gave Microsoft its big break in the software industry. And clearly the deal with Google is aimed at forging a credible frontier in the next generation of applications delivered from the web. Google has its issues with approaching the enterprise solo. Partnering with IBM adds that much more credibility to Google’s products and improves IBM’s image as a technology innovator. While utility computing through the cloud is far from replacing the traditional boxed approach, strong partnerships like these between technology giants will provide more options to small and medium businesses to remain competitive and the relevance of cloud based computing will only grow as these firms grow in prominence.